Henry Williams are proud to announce our Test House has gained UKAS accreditation - Henry Williams Ltd.
Henry Williams are proud to announce the opening of our new mechanical testing laboratory based at our Darlington facility, which has recently gained UKAS accreditation to BS EN ISO/IEC 17025. 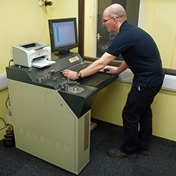 The Mechanical Testing Laboratory staff have serviced and worked in the Testing Industry for over 20 years and have extensive knowledge and understanding of Mechanical Testing. Our customers currently range from various industries which include Oil and Gas, Petrochemical, Railway , Foundries, Forges, Fastenings, Alloys, Nuts & Bolt Specialists, Steel Stockholders, Steel Tubing, Construction, Marine and Power Generation Industries throughout the UK. Working alongside our Forge, we are able to provide a ‘One Stop Shop’, from forging of materials to Heat Treatment and Mechanical Testing all done at Henry Williams Ltd.
We are here to assist and to provide a ‘First Class' service to our valued customers, no job is too big or small for our reliable team here at the Test House.